This post is my collaboration with my friend, Leora. Check out her blog on Art and Popular Culture. Also, pardon us for blogging about Christmas in the middle of Spring. Just as Christmas is a big time of the year, Christmas commercials also need to be “bigger” than the others, as journalist Eamonn Forde put it, “Ads are not just for Christmas, but the ones that run at Christmas can be the most profitable.” No matter how stringent one may be throughout the year, Christmas is the one holiday that makes people feel generous and pour their money into things that have more emotional value than practical benefit. Taking advantage of this, department store chain John Lewis has been maximizing its emotional branding strategy around the festive season through its TV commercials since 2007. The general theme of these series is how to pick the right gifts for the ones you love, told through sweet, fairy-tale like stories with unexpected twists at the end. John Lewis’ commercial spot for Christmas 2014, not surprisingly, was another big hit. It even won PETA’s Compassionate Marketing Award for featuring the adorable kinship between a little boy and a penguin. There are no words spoken in the ad to help the viewers understand the story, and yet the ad strongly gets its message across and successfully receives a resounding “awww!” from viewers. The ad builds the story layer by layer while playing a powerful song in the background, which enables people to slowly understand the story without needing a narrator. This is an example of an advertisement that effectively tells a story through both visualization and sound. The ad is almost a mini film in which the first half sets up the characters and the second half depicts the loneliness that Monty the Penguin feels and how all the knots are untied at the end. Through personification of Monty and the development of the penguin and boy’s relationship, viewers are drawn into the story, just as they are in a movie theater. Besides from the emotional storyline, the video uses visual techniques to draw the audience in emotionally. For instance, the color palette is neutral and uses similar colors. This technique creates a harmonious ambience which is visually pleasing to the human eyes and helps the audience relate more easily to the message. The soundtrack also adds to the cinematic appearance of the ad because it builds up at just the right moments in the plotline. The ad brings back a melody that is long lost for many generations of music lovers – Real Love, composed by John Lennon and covered by Tom Odell. There is a whole story behind how the song was written not long before Lennon was assassinated and how his wife and fellow members of The Beatles managed to publish the song and pass on Lennon’s legacy. So what makes music, or in this case, Real Love, provoke so much buzz in the advertising as well as the music industry? Because it fits so well with the visual content of the ad. Firstly, Real Love is an old song, and people naturally feel nostalgic towards the end of the year. They tend to reminisce their childhood with all the joy of Christmas and new toys, which also explains why John Lewis’ commercials usually feature children. Secondly, there’s dynamic piano instrumental playing for most of the song, and then towards the end when the video reveals the unexpected twist about Monty, violin was added to bring the song to a crescendo and elevate listeners’ emotion. Other musical elements such as the beautiful melody, slow tempo, and Tom Odell’s lingering voice also set the tone and pace for the visual scenes of the ad. Lastly, in ads where characters don’t talk, advertisers usually utilize lyrical music to communicate the message. In this case, it is almost as if the boy and Monty act out the words of Real Love. The lyrics say “all my little plans and schemes” and “playing with their little toys” as the boy builds his Lego house, colors pictures, and plays soccer, or when the song goes “waiting for love,” the boy and Monty catch sight of random couples on the streets. The most interesting thing about this ad is that it does not outwardly push a product. John Lewis is a trusted department store in England and the ad maintains that brand image through a gripping story. It only mentions the brand name at the end when the words “John Lewis” appear on a white background. There is no indication as to who they are or what they do. The story of the ad creates good feelings amongst its viewers and that positive emotion is then carried on to their perception of the department store. 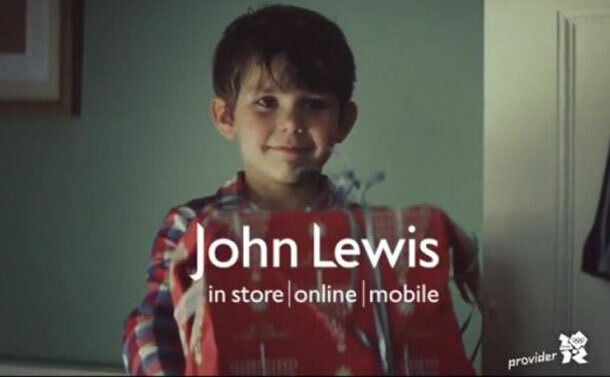 Focusing on the visual and musical qualities of an ad proves to be good marketing choices for John Lewis. 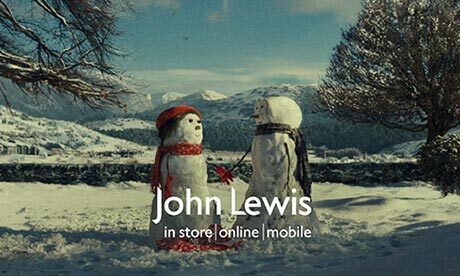 This ad and others of its type have resulted in outstanding Christmas sales for John Lewis. In a time where we are inundated with advertisements trying to sell a product, its a breath of fresh air to watch an ad that doesn’t have to try so hard to sell. People relate to the ad simply because it is aesthetically pleasing, no matter how little information it provides. Perhaps other brands will follow suit and create ads that seek to entertain its viewers as well as improve brand image through real art.